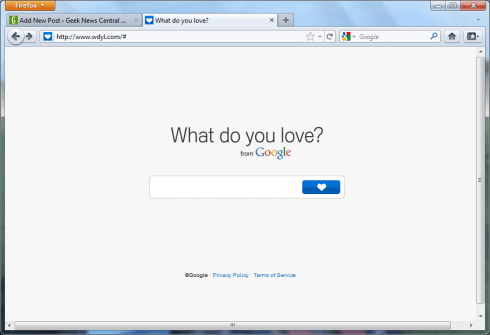 While Google+ may have been making most of the headlines, Google also introduced “What Do You Love” at www.wdyl.com. It’s a way of searching Google services such as Maps, YouTube, News, Patent Search, Blogger all at once will the results presented together. The user interface is much as you’d expect. The results are displayed on a single page broken up into applets showing the individual returns from each service. Let’s say you love kittens – who doesn’t? The results for a WDYL search for kittens is shown below. 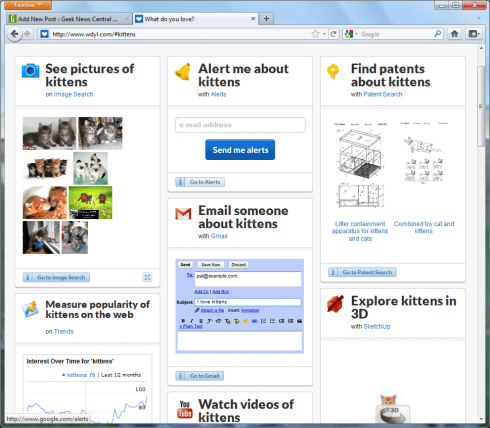 You can easily dismiss it as superficial – who cares about the popularity of kittens on the web – and the name WDYL doesn’t help. But if you were wanting to get an idea of emerging trends, say democracy in the middle east, you can see what’s happening along with (mostly) relevant books and videos from YouTube. The more you experiment with it, the more you get the feeling of how powerful a tool it is for research. There’s nothing that you couldn’t have done yourself, but by presenting everything together you can start to see synergies. WDYL isn’t going to replace standard Google search, but if you want to go a little bit further and search beyond text, give it a try.